The teachings of my new book, LOVE SPEAKS, flow from understanding the Lord’s love in his multi-faceted voice. How is the best way to GROW in deeper love and relationship with the God who IS LOVE? A daily devotion with sincere worship from your heart is a great place to start! By placing yourself in an atmosphere of praise and worship, you actually posture yourself to be in a better position to hear from God. Let me share a little more about worship, and close with a short exhortation on creating a “thin place” or, “holy space” in your home where you can cultivate worship. “Enter into His gates with thanksgiving, and His courts with praise!” (Psalm 100:4) & “Worship the Lord in the splendor of His holiness” (Psalm 96:9). One of my dear friends in Ireland led an ecumenical community of Catholics and Protestants in Dublin for many years. His name is Rónán Johnston, known by many of his friends as, Rojo. He is a gifted worship leader and musician. Here are a few thoughts he shares about the power of worship to build intimacy in his recent book. “What a better way to learn how to be in this place of intimacy with God than worship? Worship is itself time spent in that most intimate place with God, and the more time we spend there, the more familiar we will become with the sound of His voice. I am not in any way advocating a lack of Scripture reading, but rather a deeper knowing of God. “The greatest saints of the past, those who have really stayed with us, inspired us in our own walk with God, and challenged us to take up the cross daily, these are not necessarily people who were great theologians or powerful ideologues. Rather, they are people who loved God more than others. Not great thinkers, but great lovers. “Enter into the Holy of Holies through songs of worship, within the veil of the temple, and live out your life in joyful surrender to the will of the One who knows us, who chose us, and who Himself loves us” (an excerpt from, “Trust, Surrender, Believe, Receive” by Rónán Johnston). For a practical application, may I send you a challenge to create a “thin place” or, “holy space” in your home or natural surroundings? An actual place, like a favorite sitting area, or a room like a study, or even a favorite chair, where you can dedicate that space to God’s glory and return there often to pray, to listen, and to praise and worship Him? The idea was that so much praise, worship, and intimate listening to God went on in certain places, hour after hour or day after day, that the veil of the temple became “thin” which means: the atmosphere became almost heavenly. 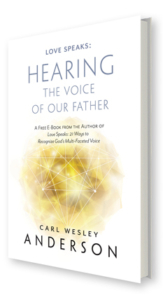 Like Heaven touching earth in a particular place, with the veil in the Holy Spirit’s realm thin and the ability for one to hear God’s voice heightened. Many of you are aware I am in the midst of filming 8 new documentary short films based on the first 7 ways that “Love Speaks” for wide distribution. Just 4 weeks ago I found myself at one of the best-preserved Christian monasteries in the known world, and possibly the most spectacular prayer site on earth. 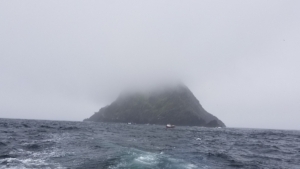 My actual photo of Skellig Michael, wrapped in a cloud of glory on the day of my visit! The spotlight of the world is showing upon it as the hidden place of Luke Skywalker at the end of Star Wars 7 and the beginning of Star Wars 8 (released in theatres this Christmas)! 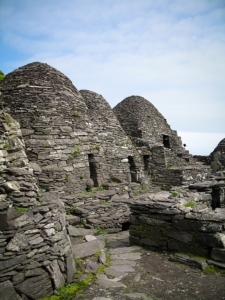 The LORD spoke to me and told me to go to Skellig Michael, an island monastery off the Southwest Coast of Ireland, and open my new Series of films by filming there. My films will help re-focus the attention of the world from a “fictional place” of a mystic Jedi to a “real-world place” where monks dedicated their lives in praise, worship, and the word for 700 years. 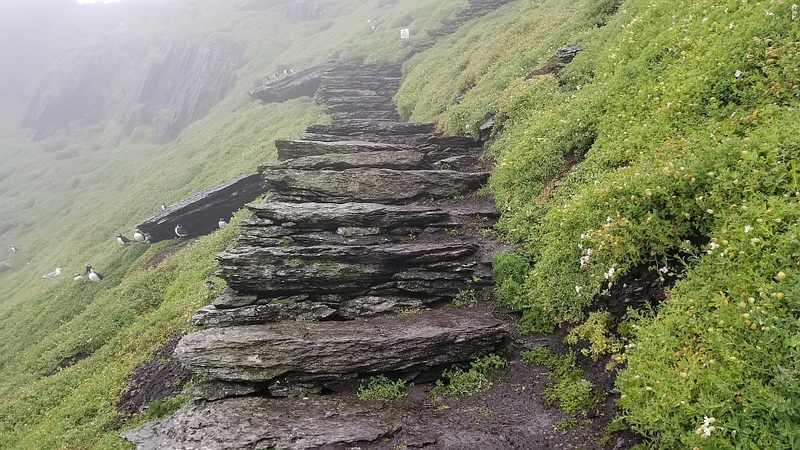 I climbed up to the top of 600 ancient stone steps, carved by the monks of the 5th-12th Centuries, and walked into a beehive stone hut and walked right into the tangible Presence of God! Yes, this was a, “thin place” and a literal place of extreme devotion to God. Monks had worshipped the King of Kings there for possibly 700 years, and the Presence of God is still lingering about as a result. It’s also a challenge: live the rest of 2017 and the rest of your life in daily devotion to God, in praise and worship, and create your very own “thin place” where, 700 years after you are dead and gone, the Spirit of God might just still be lingering about. The Word of Wisdom: unlocking your destiny Does God Check His Voicemail?